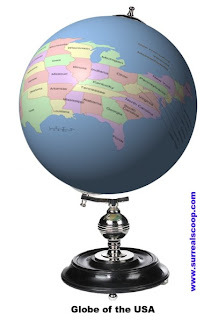 They are the new 'must have' items that are sweeping across the United States of America where a religious gift company from Tennessee has produced a new range of globes featuring the "American Worldview". The globes have not only been a surprise sales success but are gaining endorsements from schools and religious groups across the United States of America. "Parents and schools from coast to coast are trying to give children the correct view of the world and we think our product, the United Globe of America, fits that market," said a spokesman for 'Balls to the World Incorporated'. 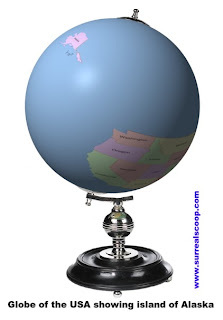 The new globe is available in a range of sizes, shows the American world-view, and has been endorsed by religious groups across fourteen southern states of the USA. "The people of this country, this great country, God's country, as foretold by scripture, have long been done a terrible disservice by the so-called map-makers. They have filled our schools with books full of lies and myths of strange and evil places, filled with godless people and their heathen ways." said Pastor Jesse Billingsworth of the Glen-Rivers Baptist Church of Nashville, Tennessee. "Now God-fearing moms and pops and educators, from sea to shining sea, can drive out the evil myth of Canada forever." The new globes have spawned some muted criticism from geographers in the United States, who point out the preposterousness of the idea that nothing exists outside of the US. "Whilst the globes beautifully illustrate the total isolation of the USA and the loneliness of the islands of Hawaii and Alaska, it is quite ridiculous to be telling children in school that Mexico is a myth created by the devil," said James Kablowski, a curator of cartography at the Smithsonian. "Where do they think their Santa has been outsourced too?" The most vocal opposition to the new globe has come from European scientists, however they have been struggling to make their case heard on the leading opinion forming news outlets in the US. "This is an important subject so we devoted a whole two minute segment to this on The Factor," shouted Fox News alleged-journalist Bill O'Reilly. "We interviewed a guy claiming to be from somewhere called France but you could tell from his accent he was just some sort of devil worshipping communist. Who killed Lady Di." The globe has already been used in schools in Tennessee, but religious campaigners are pushing for it to be used nation-wide by 2009. They are also hoping to have stickers added to traditional globes and atlases informing students of the new globe and their theory of ‘Intelligent Geography’. When do you post next article?